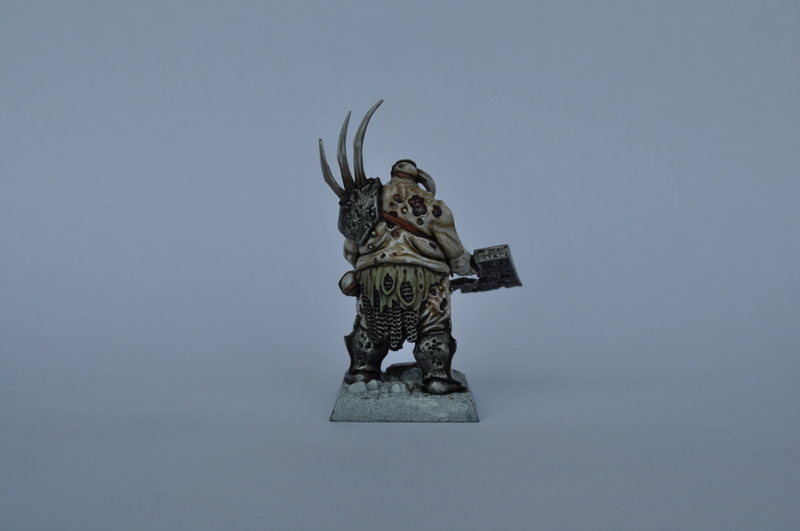 Chaos Lord of Nurgle – for sale! Hot on the heels of those Austrian generals is something completely different: a Warhammer model. 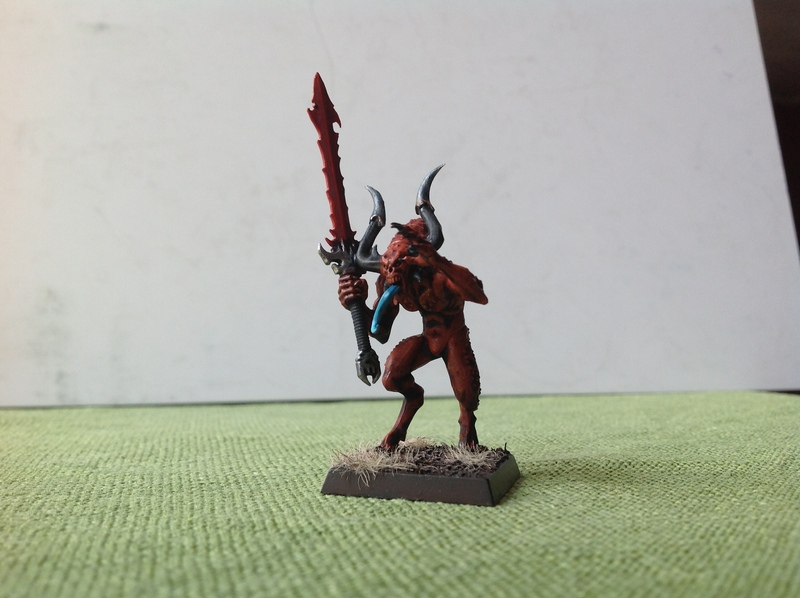 It’s the first Warhammer model I’ve painted since those Bloodletters months ago, and even they were a small a drop in a vast sea of historical figure painting output. Nevertheless, here we are. Remember that guest contribution in August? I was so impressed by my buddy Pieter-Jan’s paintjob of this figure that I just had to go and buy one for myself. Let’s take a look! The only converting I did was to remove the holes in the helmet with some greenstuff. He’s got a big eye in his gut, after all! I’m quite pleased with having done so; putting paint to this model was great fun. It’s defined several major areas with vastly different texture – skin that has both raised and sunken detail, segmented armour but with large flat plates, some tattered cloth, chainmail… A suitable canvas for a painter desiring a challenge! You can see the skin highlights a little better in this one. How did I paint it? I’m happy to say I gained a lot of practical knowledge from this model. I started off with a white basecoat which was a bit more heavily applied from the top than from the bottom, as a sort of zenithal highlight to the grey plastic. I then painted much of the skin areas first, with a basecoat of flayed one flesh followed by thin washes of athonian camoshade and agrax earthshade. Then some highlights: the base colour followed by pure white, in a feathered manner. The gut and other skin abrasions were then washed carefully with thin consecutive washes of druchii violet, reikland fleshshade, carroburg crimson, seraphim sepia until I was satisfied. And then some biel-tan green washes just to gorify everything (of course). Many bits on this model made my girlfriend cringe. Success! The part of the model which I’m most satisfied with is the metallic areas. These were basecoated runefang steel and then washed consecutively with nuln oil, agrax earthshade, biel-tan green and drakenhof nightshade. A dark patina was created by these washes leaving just a hint of metallics underneath and on the edges. I then dug in with pure runefang steel and streaked, blotched and feathered a heavy layer of weathering which doubles as a highlight; you’ll probably understand this took quite some time. Lighting’s a little better in this one. I more or less secretly wanted to paint this model up to see if I could outdo Pieter-Jan’s stellar version of him. Along the way that goal was totally side-tracked as I strayed ever further from the ‘classic’ GW colour scheme which Pieter-Jan somewhat adhered to (At least I think he did). In the end, I think we both delivered great paintjobs (I hope my readers will agree on that) but took the model in distinctly separate directions with him. As you will undoubtedly have gathered from the title of this blog post, I’m very much willing to sell this chap on. I don’t have a Nurgle army not will I ever collect one, so I’d be happy for another wargamer to push him around on the tabletop or grace a glass cabinet or what have you. If you’re interested, don’t hesitate to make me an offer – contact me at laurensvannijvel at hotmail dot com. I’m not asking overly much for this model; twice the retail price plus any p&p costs that might be incurred. The model’s basing will also be finished according to preference. If I can sell this chap on, you can expect some more of these features from me! As said I had a great time painting him, and I might do some of the other plastic characters GW has been releasing lately (not the resin ones, I’m not tired of life). One of the better character models Games Workshop has released recently. As you can see from the pictures, this friend of mine – Pieter-Jan is his name – has become quite an accomplished painter. Since he’s in the armed forces and barracked I reckon he doesn’t have much time to hone his skills, so I was pleasantly surprised when he showed me this model yesterday. I’m guessing he probably followed the example of the ‘Eavy Metal colour scheme with some minor alterations, but as you will probably understand I’m unable to give you the usual run-down of the paintjob. The one thing I’d add to this model is an additional highlight on the black loincloth. I guess there’s nothing else for it but to pick up my own sample of this model and have a go at it myself, to see if I can do an equally good or perhaps even better job of it. In the meantime, I hope you enjoy these pictures and that you take the time to congratulate Pieter-Jan. And if you’d like to see this kind of blog post featured more in the future, please let me know! It’ll be a busy weekend on the blog as there will be some Vikings as well, and the aforementioned painting guide, plus some Sarmatians next week. Stay tuned! These fellows have been lying around in the back of my car since my birthday (16 February) which means they’ve had to wait half a year to get even the slightest bit of attention – even acknowledgement – from me. The reason for this is, of course, that I’ve since been dragged into many different historical projects, and my Warhammer stuff has remained largely untouched. Still, I wanted to do something non-human for a change, and for that purpose I decided to build and paint these guys. As you can see, ranking them up is quite tricky. These models are a fairly new GW kit, and as far as options go I’m a bit disappointed with them. GW used to cram lots of bits and bobs into the kit to personalise the models or to convert other models, but apart from choosing between command options or regular swords you have not a single extra part in this kit. Ten bodies, ten heads, ten faces, ten swords. Quite a shame, as I was thinking of using the spare parts together with Chaos Warriors to kitbash some Forsaken. The arms also go onto the bodies in just one way, so while the poses are rather varied, you can’t be creative with them. I really didn’t want to spend a lot of time on these guys, so I built them in an hour and then painted them on Friday in a single day. 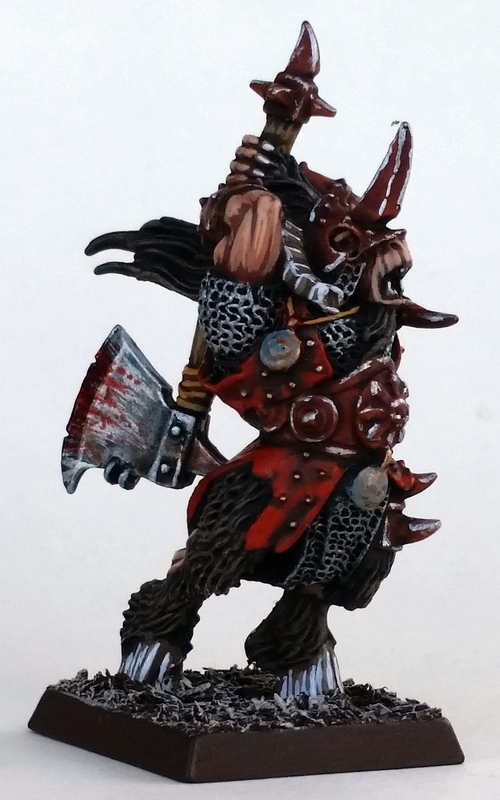 Most of the time was spent waiting for the washes to dry – the orange was painted macharius solar orange and washed agrax earthshade then carroburg crimson, and the silver was painted runefang steel washed with Vallejo smoky ink and drakenhof nightshade. 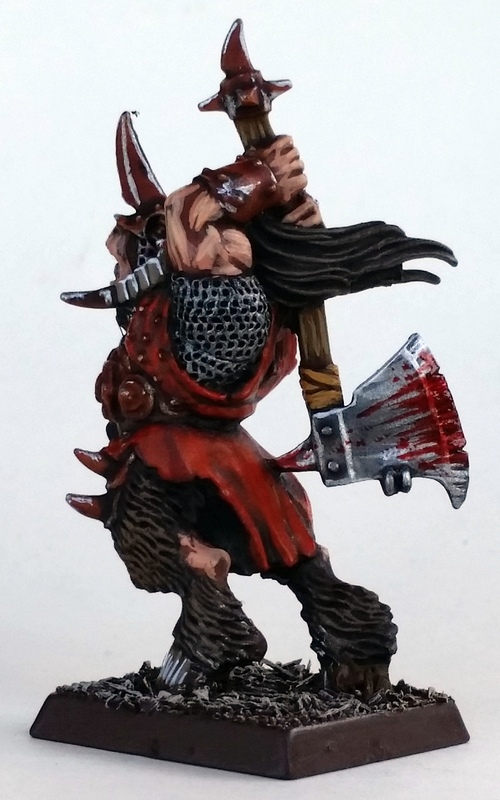 I’m not completely sold on the red swords, they were painted blood red, washed agrax earthshade and carroburg crimson as well, and then edge highlighted with blood red again. The contrast isn’t superb, so I think I’m going to look for a bright orange tone and do an extra highlight. 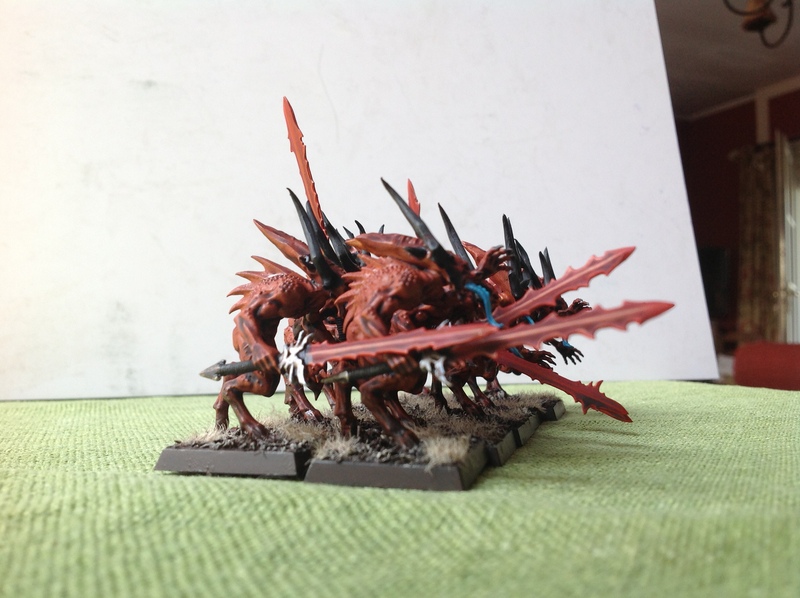 These are the only Daemon models in my possession at the moment, and I’m going to keep it that way for a bit. They were the flavour-of-the-month army recently so I might be able to get some second-hand deals in the near future, but I’ll not actively look for them – too many other exciting historical projects to consider! As for next week: a couple more Napoleonics, with Maréchal Ney’s aides-de-camp, Heymes and Levavasseur, in the pipeline. And a scenery item, too! The sun shines, the spring blossoms sway in the breeze, and I’m at the office tending to the needs of undeserving people. In other words: High time for another blog update! 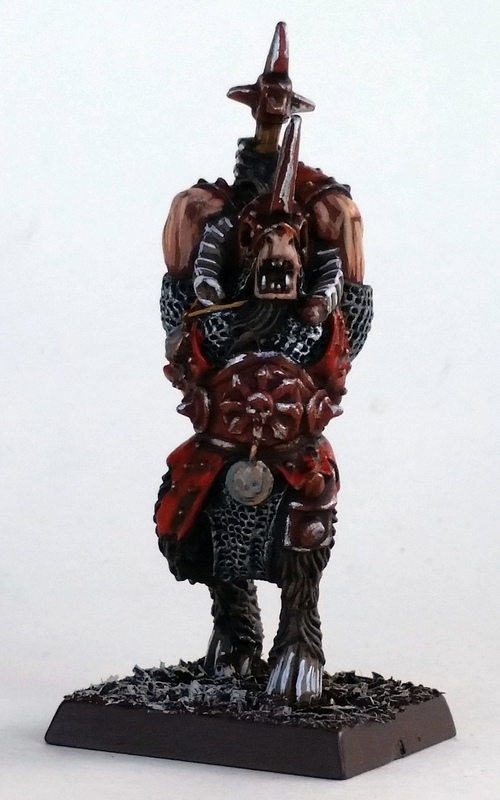 Since I have all these painted models lying about from previous projects that have that look in their (crookedly painted) eyes of “Please photograph me master, I love you master” I’ve decided to kick off a weekly series of updates about an old paintjob of mine. Henceforth, let’s call it Yesteryear Wednesday. Cute, isn’t it. As it’s been awhile since I’ve posted some Warhammer Fantasy stuff, let’s kick off with a unit of Chaos Knights. 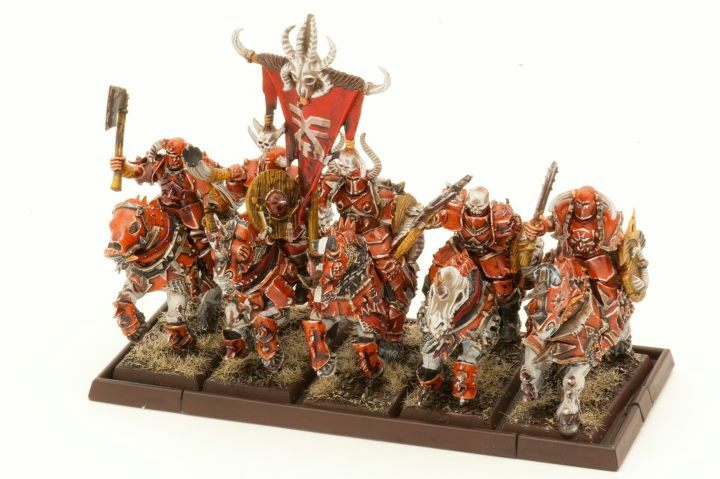 These models were also photographed by Bo of GW Gent. 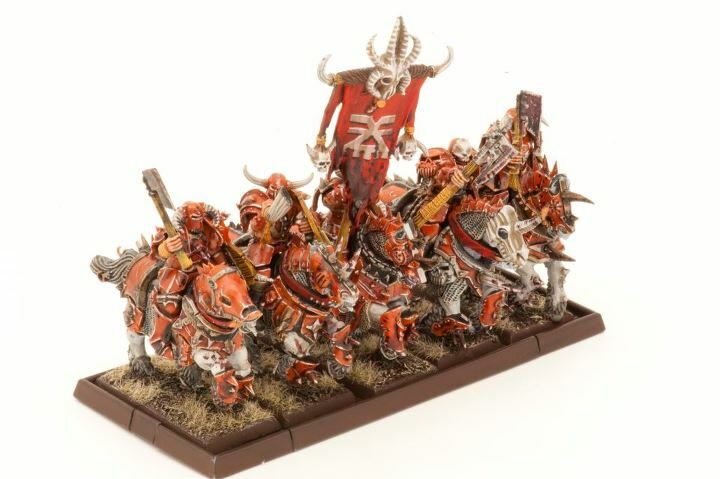 This unit is the first, and currently only, of a Khorne-themed army which is to form part of a Grand Host of Chaos as per the Tamurkhan rules. 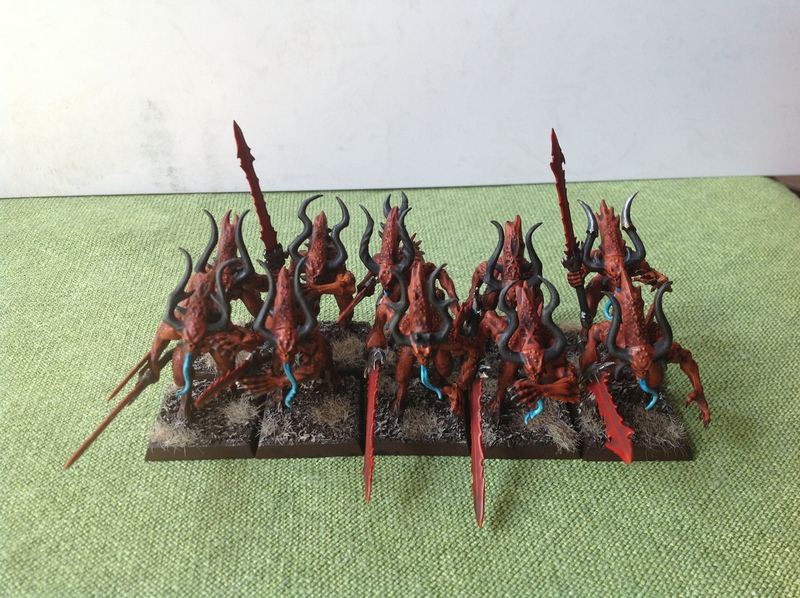 For this reason, I chose to paint them with the same colours and techniques as my Beastmen which you’ve probably seen before on the blog. 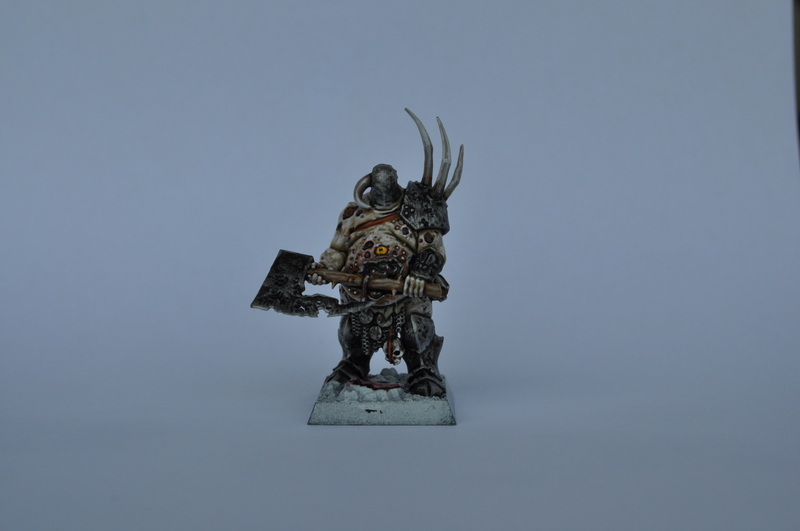 While the kit itself is really great, with lots of individuality to the five models, I slightly converted the models with Beastmen weapons and shields, and with heads from the regular Chaos Warriors. 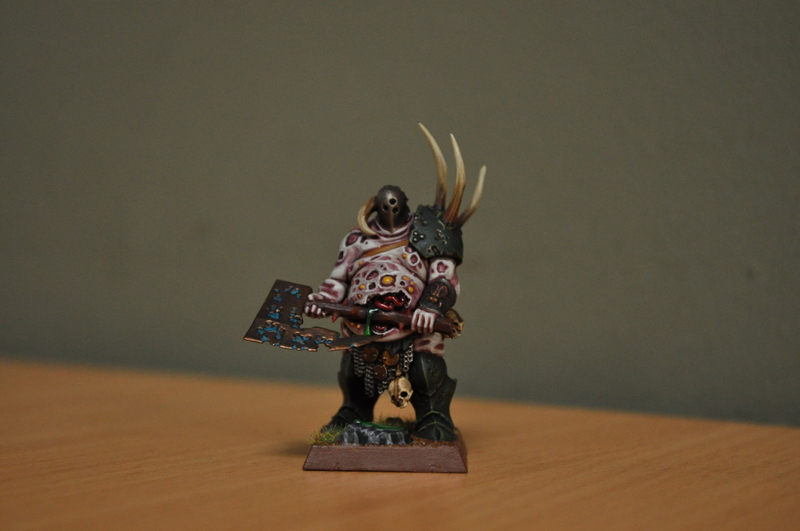 I wanted them to look slightly more feral to have them tie in better with the Beastmen themselves. One of the better kits GW has released in recent years, decently priced too. 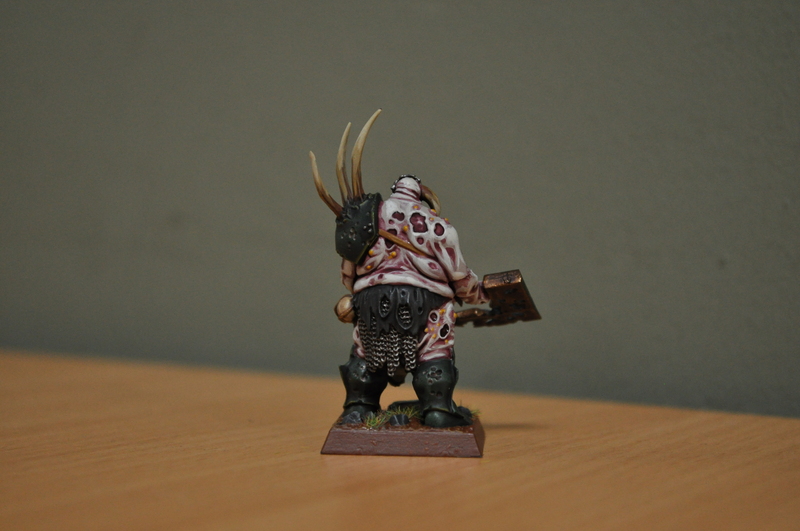 Painting was relatively straightforward, with most of the models being covered in metal. This was basecoated with macharius solar orange, washed with devlan mud and baal red, and then edged and weathered in one go with mithril silver. I wanted to do an orange army for the longest time, and it’s a relatively simple technique so I’m quite pleased with it. I really should get going with some more Chaos on the painting table, but it seems historicals have taken over; I’ve hardly painted a Warhammer Fantasy model since these Chaos Knights, last summer. Speaking of knights: the Sarmatians are nearing completion. They won’t be done today or tomorrow, but I’ll certainly have them done by the end of the week. Until then!